Animonda Carny Kitten is tasty, balanced and healthy food for your kitten in its first year of life. The wet food contains special, small, kitten-friendly chunks of meat. 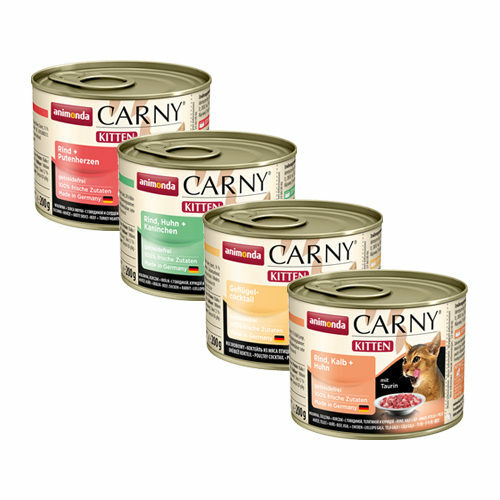 Carny Kitten from Animonda is tasty, balanced and healthy wet food for kittens in the first year of their life. The food contains small, delicate pieces of meat, so your kitten can easily swallow it. Carny Kitten contains all the essential nutrients your small cat needs; it contains 100% fresh, meaty ingredients and taurine. The food does not contain grains or soy. Animonda Carny Kitten - Beef with Turkey: 50% beef (meat, deer, liver, lung, kidney, udder), 15% turkey heart and calcium carbonate. Animonda Carny Kitten - Beef with Chicken and Rabbit: 33% beef (lung, heart, meat, kidney, udder), 20% chicken liver, 12% rabbit meat and calcium carbonate. Animonda Carny Kitten - Beef with Poultry: 39% beef (lung, heart, meat, kidney, udder), 14% chicken liver, 6% turkey heart, 6% duck heart and calcium carbonate. Animonda Carny Kitten - Beef with Calf and Chicken: 32% beef (heart, meat, kidney, udder), 17% calf (lung, liver), 16% chicken (liver, stomach) and calcium carbonate. Have you used Animonda Carny Kitten before? Let us know what you think about this product.